I visited last week Fortum’s waste to energy plant in Klaipeda, Lithuania, a plant we commissioned in May 2013. Even though the plant was in an annual outage during the visit, it was impressive to walk around and see the operational logic of it. To do good, that is exactly what is so beautiful in the waste to energy business. Waste has transformed from a societal problem to a huge opportunity in less than a decade. We recover energy from Klaipeda region municipal waste for both heat and power. The plant utilizes waste that otherwise would be landfilled and become a societal problem. And we reduce emissions as we replace fossil generation. 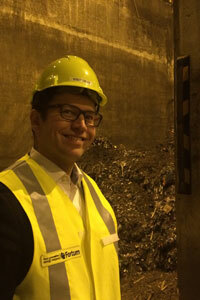 It was especially impressive to witness that the general perception on waste management does not hold anymore. The plant is actually very tidy and clean, and practically without any smell. We had problems in the beginning due to local resistance. The local community’s perception of waste burning was very negative. This also reflected on environmental permitting, which was finally granted a day before the operations started. Now two years down the road, the situation has improved, and local acceptance is good. We have an active dialogue with civil society and invite them to visit the plant regularly. We are also happy to host visitors from other regions, which consider building similar plants. We have proven our case and learned our lessons. At the same time, the local community has overcome their prejudices. Now the Lithuanian government wants actually to have two additional waste to energy plants to be built in Lithuania, one in Kaunas and another in Vilnius. There are several types of waste, which makes the business case for waste to energy business more complicated. Municipal Solid Waste (MSW) is the raw waste, which is usually landfilled in several European countries. This type of waste could be sorted. After sorting, shredding and drying, refuse-derived fuel (RDF) is formed. The energy content of RDF is higher than in MSW but the volumes after recycling diminish. That means that sorting decreases the amount of waste energy available as fuel although the quality in terms of energy content is better. Many of the waste to energy plants in Europe are designed to operate on MSW. The logic behind this is that landfills will gradually be forbidden and penalized as policy makers are raising ambition levels for circular economy and want to favour recycling. In principle, this is great. In practice, it has led to excessive subsidies for mechanical (MT) and mechanical biological treatment (MBT) plants, which transform MSW to RDF. Many of these sorting facilities are based on EU or public funding. The economic value of sorting at these special plants is, however, questionable as sorting is much more efficient when done by consumers and industry when the waste is created. The EU Waste Framework Directive has set a recycling and recovery target of at least 50 % of the municipal waste by weight in 2020, and some nations are considering even more ambitious targets. I do believe we need to sort more going further and gradually increase the ambition level. At the same time, recycling should be economically, environmentally or technically feasible and sustainable. I do not oppose a ramp up of mechanical biological centralized sorting of waste – as long as the commercial logic holds. Commercial success needs predictability and consistent operating framework. We definitely need to stop landfilling waste. We should, however, not change the waste policy every five years, but try to stick to one policy in the long term and align national policies. Waste-to energy plants are log-term investments. One of the key strategic issues is how to secure the required amounts of waste as fuel in the future, considering the increasing recycling rates and limitations to waste shipments within and between the EU countries. We need to increase recycling, but, at least in my opinion, it should be done by incentivizing consumers and waste markets to sort as much as possible themselves – the remaining residual waste should be burnt and the energy generated recovered. The subsidies for centralized recycling plants do not make economic, environmental or technical sense, and it harms the good that several commercial players are trying to do.